BANEPA, March 30: As many as 14 transport committees have waged a fierce war against Mayur Yatayat transportation service in Banepa, Dhulikhel. As this newly introduced transportation service posed threat to their strong syndicate along the Araniko Highway, the other transport entrepreneurs have united against it. 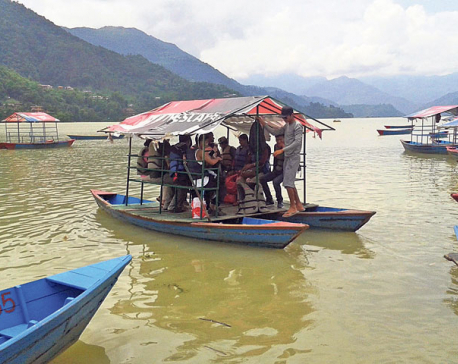 Demanding cancelation of its Kathmandu-Banepa route permit, the entrepreneurs have threatened to bring transportation service to a halt in several areas of Kavre in case their demand is not fulfilled. The tussle which came to surface two weeks ago has not simmered. 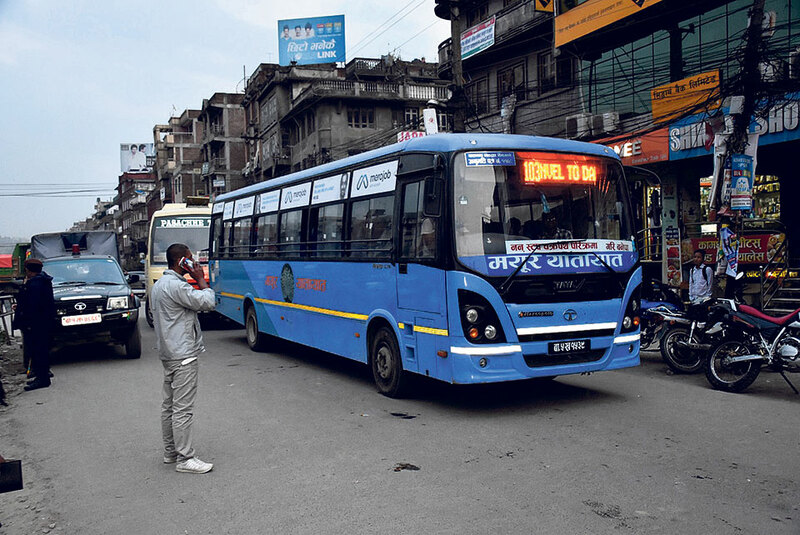 Despite troubles created by the committees, Mayur Yatayat kept on providing bus service in its regular route from Kathmandu's ring road to Banepa. The company had started its service on March 15 with 24 luxury buses. Low bus fare and better comfort had made it popular among the people soon after its operation. Other bus committees in the same route have warned to halt transportation service in the town and rural areas starting from Sunday. Kavre Minibus, Kavre Bus and Bhaktapur Minibus have stated that they won't provide service from next week. They have even handed over a memorandum to Kavre CDO Shiva Prasad Simkhada. However, Simkhada is vocal against such syndicate. “Syndicate is unlawful. There should always be room for healthy competition. So, no matter how much they make noise, we are not going to support them,” he said. “They must fix the bus fare through healthy competition instead of deciding it as per their will. The government has put a ceiling to the rates and the committees must abide by it. But syndicate makes them stronger and the government weaker, so we must take right action to break this syndicate,” he added. The 14 committees had been plying Araniko Highway and other routes for the past four decades. If any other company wanted to provide service in this route, the committees would not allow it unless they would be registered under their committees. Thus, the syndicate system was enjoying monopoly along the route. Other bus entrepreneurs tried to provide service along the route, but the syndicate system always discouraged them. Amid such scenario, passengers were forced to pay high fare for poor service. Such syndicate was widely criticized but still it has prevailed for a long time. According to Ashok Byanju, mayor of Dhulikehl Municipality, syndicate system is a disease and has to be done away with. Few years ago, a group of transport entrepreneurs led by Byanju himself had tried to launch bus service along Dhulikhel-Nepalthok and Dhulikhel-Kathmandu routes. However, after they were told that they can get route permit only if they bring consent letter from the then existing transport entrepreneurs, the group gave up. Similarly, President of Sarokar Samaj Rameshwor Thapa had also tried to introduce Namobuddha-Bihabar-Lalitpur transport service. But the District Administration Office, Kavre was not ready to register it. It was because of the strong syndicate of Kavre Minibus and Lalitpur Minibus. “The administration told me that I must get consent letter from Kavre and Lalitpur minibus. But they would simply not provide it. 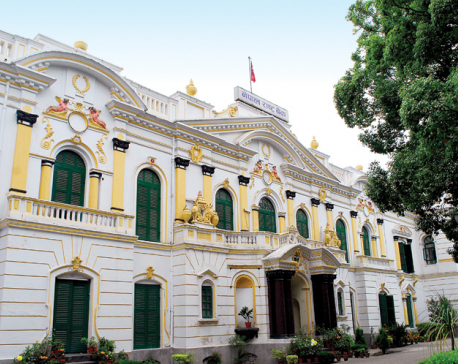 I had to drop my plan then,” Thapa said. Now, if Mayur Yatayat wins, it will be a victory of people against syndicate, notes Rabin Shakya, former chairperson of Banepa Nagar Service Committee. “This voice against syndicate was raised since years. Now, we see a glimmer of hope,” he said. There is no unison in bus fare along the Araniko Highway. Shakya says that the buses charge in between Rs 45 to 50 for the same route, which is more than the fare set by the government. Mayur Yatayat, on the other hand, is providing service at a low rate. It has been charging Rs 35 from Kavre to Koteshwar. “In fact, that's just a fine amount. People feel, it is reasonable. However, the administration did not show the guts to take action against those who were charging high rates,” Shakya said. Meanwhile, CDO Simkhada firmly expressed that the 'days of syndicate system' is now over. “The government policy does not allow syndication. We will not allow such things to happen. Mayur Yatayat will get to provide its service freely, we will ensure that,” he said.